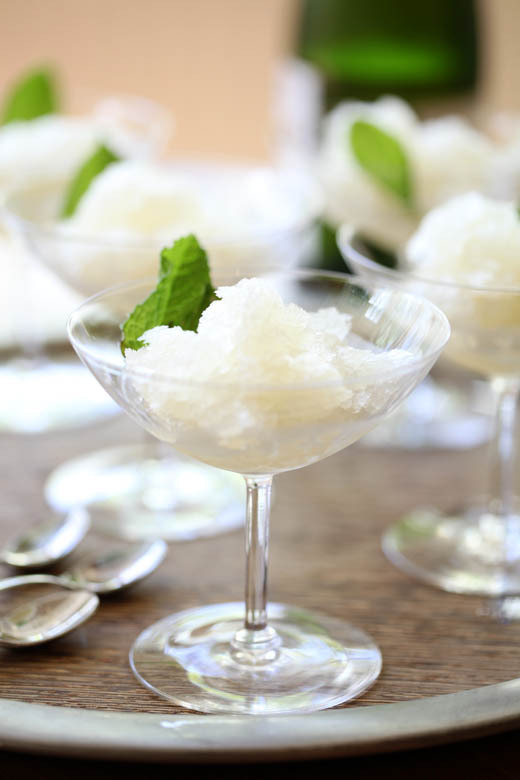 Lemon Champagne Mint Cocktails turned into Granita! A couple weeks ago I mentioned on my Twitter page that I was competing with my neighbor in a cocktail pour-off. I couldn’t share my recipe then, because spying eyes from across the lawn could not be trusted. Truth be told, I was in over my head on this one and needed any advantage I could get. In the end my neighbor Kathy won with her refreshing and seasonal “Dirty Ramp-tinis.” She pickled the ramps, then poured ice cold gin over them and drizzled a bit of the pickling juice into the glass. They were simple perfection. I bowed my head to her after the first sip. My creations were dessert to her cocktail appetizers. I, of course, went for something with a bit of sweetness, but also tart and refreshing. I have been known to enjoy my sparkling beverages in the form of cava, prosecco and champagne; it was bound to be featured it in the glass. I had candied kumquats in my cupboard and lemongrass in my crisper drawer, so a citrus theme was born. I made a Meyer lemon and lemongrass sorbet to float in the champagne. I came in second (it was just the two of us competing), but I think I could have won against anything other than the “Dirty Ramp-tinis.” I did get extra points for presentation; I used my grandmother’s glasses and the drink really was lovely. As I was enjoying my “Lemongrass Champagne Fizz Cocktail” I was already planning to make these same ingredients into a simple granita. 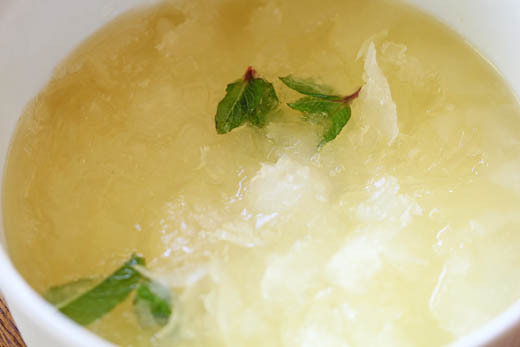 Granita is like the rugged cousin of the sorbet. 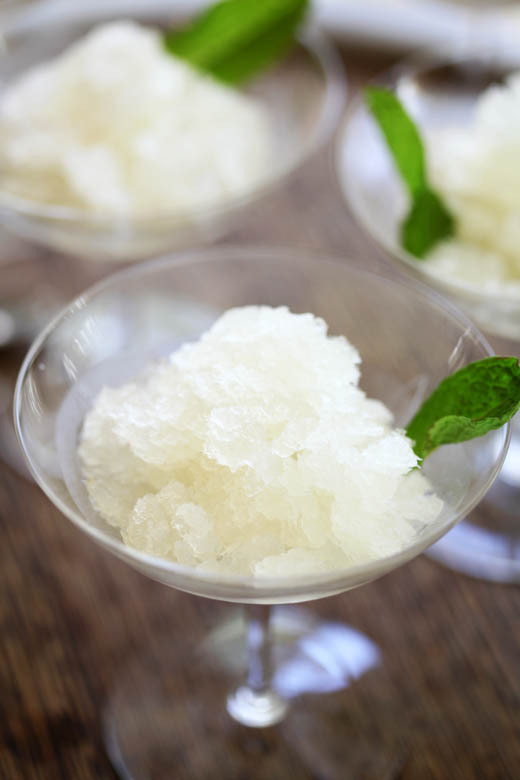 It has large crystals of flavored ice that require nothing but a basic freezer to make. It is perfect for those without an ice cream maker or those, like me, who just forgot to freeze the one I do own. It also doesn’t require a precise recipe to freeze smooth, since part of its charm is the icy texture. The Cake Decorating Giveaway is still open. Click to read more details on how to win a Cupcake decorating set! 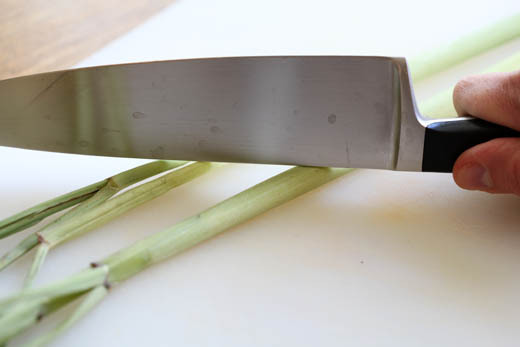 With the back of a knife, hit the lemongrass to “bruise” it. This gets some of the juices flowing and it will have more flavor. Cut it up into 1/4-inch slices. 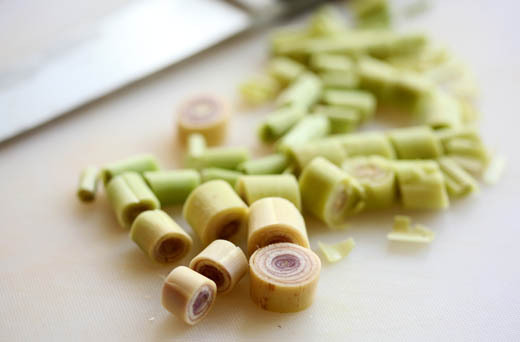 In a sauce pot combine the sugar, water and cut lemongrass, cook until the sugar is completely disolved. Let the syrup sit until cool to allow the lemongrass to steep. The longer the simple syrup sits with the lemongrass, the more intense the flavor will be. 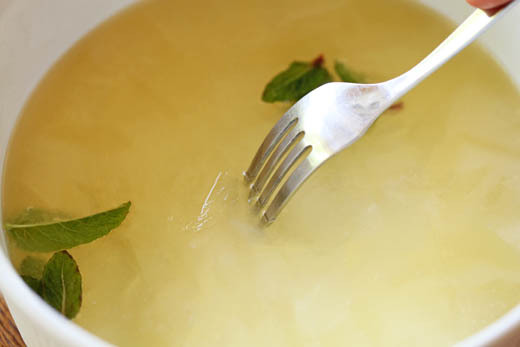 In a large bowl combine the Meyer lemon, zest, 1 cup of water and 1 cup of the lemongrass simple syrup. 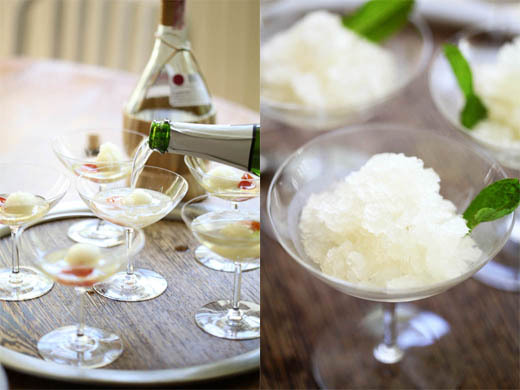 Read my no-fail Sorbet making tips to create the sorbet base. This will require you to add more water and simple syrup until you have reached just the right sugar levels. Once you have achieved this, freeze it in your ice cream maker as they instruct. 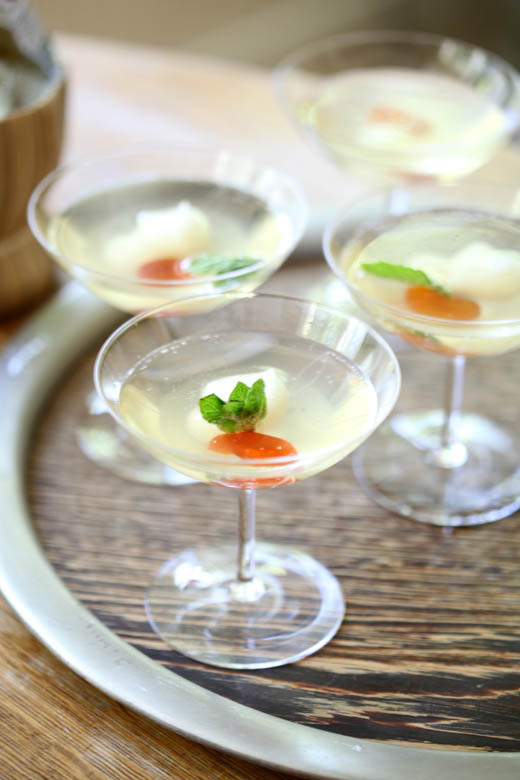 In your serving glasses put a candied kumquat, 1 tablespoon lemongrass simple syrup and a scoop of the sorbet. Pour Champagne over them and top with a sprig of mint. 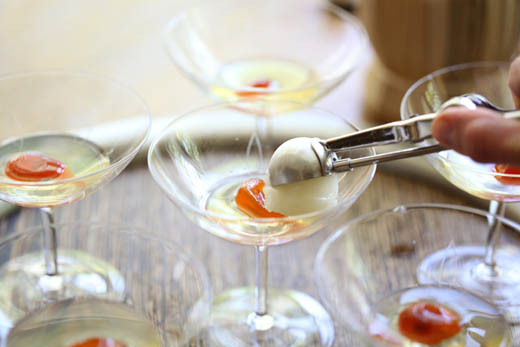 In a large bowl combine about 1/2 bottle of champagne, Meyer lemon juice, zest, 1 cup water and simple syrup to taste. Remember this is not an exact science, it should just taste great. Add about 10 whole mint leaves. Place the bowl in the freezer and leave for about 1 hour. 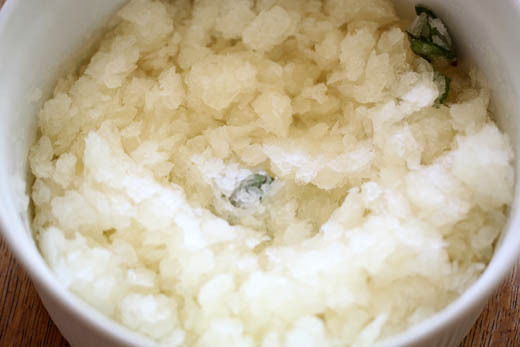 Stir the mixture with a fork, breaking up the ice crystals that will have formed on the surface. Stick it back in the freezer for another 30 minutes. Remove from the freezer and break up the large chunks of ice with the fork again. Repeat this ever 30 minutes until the mixture no longer has any liquid. It will be light and fluffy ice crystals that melt in your mouth. 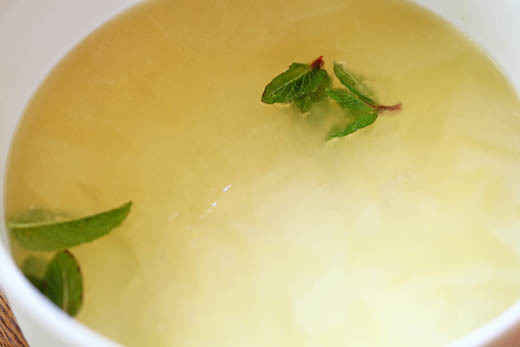 Spoon the mixture into glasses and serve immediately with fresh mint leaves. Enjoy! What a great competition – sounds like everyone went all out on it! Your cocktail sounds so refreshing, plus it’s gorgeous! I watched Curtis Stone make something similar to this on one of his episodes of “Take Home Chef”. This looks like a fabulous icy summer treat for when our heat starts to roll in down here. This looks SO good, I want one right now. Love the exotic touches of the candied kumquat and lemongrass. Hi Zoe! Quick question about the lemongrass simple syrup . . . I live in the middle of nowhere, and would probably fall over in my local grocery store ever stocked fresh lemongrass. If I wanted to try this with dried (obviously not as good, I know) how much would I use? Any guesses? Yes, it should work, but may require quite a bit to get any real flavor out of it. I’d add as much as a cup of it. Because it is dried it will absorb some of the water in the recipe, so you may have to add a couple of tablespoons to the finished simple syrup if it is too think? Your delicious sounding recipe inspired me, having just returned from a Mediterranean cruise with candied kumquats from Corfu and Limoncello from Sorrento. I used my mother’s gracefully shallow champagne glasses, poured in some Limoncello, added the kumquat and a nice Italian lemon sorbet and some nice Italian Prosecco. Almost homemade…..
What a wonderful way to continue the feel from your cruise! This recipe sounds fabulous….I’m drooling to get one. I have been looking for ages for glasses like your grandmothers. What would you call them? I’ve seen and searched for “compote” glasses. Maybe I’m missing the correct word but I can’t find anything else to search for.